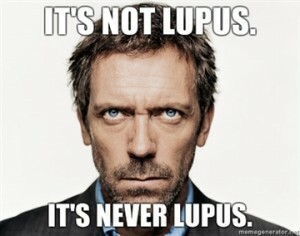 I used to watch the TV series “House” because he mentioned Lupus all the time. His general theme was “It’s never Lupus” became a famous saying. Which was GREAT because at least Lupus was being mentioned and people were becoming more aware of it. So I kept watching that show. On the last couple of seasons of that show, they tried very hard never to say Lupus for some reason. 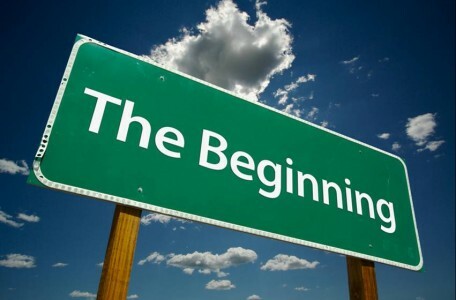 They started calling it “SLE” (Systemic Lupus Erythematosus) or “some unknown autoimmune problem”. Anything but Lupus. So I kind of quit watching the show after that, and then it ended. They should have kept saying Lupus in my opinion. It was interesting! So many people to this day are seeking answers to this mysterious disease. I often find myself answering questions about getting a lupus diagnosis or talking to people that are newly diagnosed. So I thought this was a good place to start the LFL blog. Getting a diagnosis is not easy. I have yet to hear of a person that wasn’t feeling well one day, walked into their Dr.’s office and came out that day with a Lupus diagnosis. It takes a long time. And in the mean time one or more Dr.’s are likely to insinuate or blatantly tell you that you are a hypochondriac. Years can go by before getting a Lupus diagnosis. It’s not uncommon! Make sure you are seeing a Rheumatologist. A Rheumatologist is not a doctor for old people with arthritis. A Rheumatologist, whom we like to call a Rheumy, is a doctor that deals with immune problems. If you suspect you have an immune problem, you need to see a Rheumy in order to get an accurate diagnosis. You wouldn’t ask your baker about a problem with your car would you? NO! Go to a mechanic! And hopefully you can find a GOOD mechanic. Not all mechanics are equal. And neither are Rheumy’s. Find a good one! In order to get a diagnosis, you must have several of these symptoms, but not all. You must have positive Lupus lab work done, but not all the time. See how tricky this is getting? A doctor might look at your past medical history and maybe that of other people in your family. The doctor may take biopsies of rashes or do other work ups. 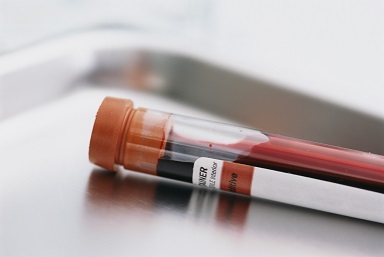 Sometimes a person will have blood drawn and get a negative and other times a positive. It’s all very complicated. As for the lab work, I always recommend to people to have the blood work drawn when you are feeling at your worst. Invariably a persons doctor appointment will fall on a day when they are feeling better. This always happens! I don’t know why. You try to explain to the doctor that you WERE feeling bad and you feel like an idiot. If he asks for blood to be drawn, ask him to put in an order for your blood work but let it stand until you are feeling at your worst before you go in to get the blood drawn. Sometimes this might take 2 or more weeks. But wait! You’re labs will be more accurate if you wait until some immune responses are actually happening when you get your labs done. THEN go in to the doctor and go over the labs at a later time. Most likely you’ll feel less of an idiot if the labs show you at your worst and the doctor will be able to tell more from that as well. If you are seeing a Rheumy he’ll know what to order, but it’s a good thing to become familiar with these labs. When you are getting them drawn, I always talk to the technician and ask them what labs they are drawing and kind of double check that these are being done. If Lupus is a concern, make sure that the urinalysis is not forgotten. That has to happen too! Another thing I really recommend to do is keep as much of your medical chart at home for your own personal reference as possible. Ask for copies of your lab work especially! Your medical records are yours. So get them. If you get them as you go along you can most likely get them for free too. If you go in and want all your records from the past, they most likely will charge you a fee for that. But one lab sheet at a time is easy to do. 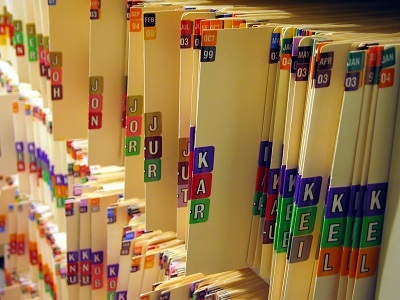 Keep them in a file at home where you can refer to them easily. Keep a log of when you went to the doctor and what they said. 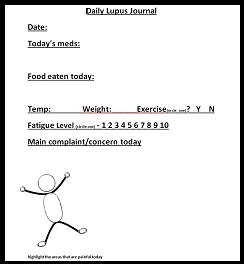 Doctors keep notes on you, you can do the same on them. You can look up on the internet how to interpret your labs and become familiar with what is normal for you and what to watch for. If you want a copy of this page to make copies of and make your own notebook, just email me: valinda@leapforlupus.org and I’ll send it to you. Also in this modern age, we have awesome things called apps. Here are links to a couple of them that you might want to try.